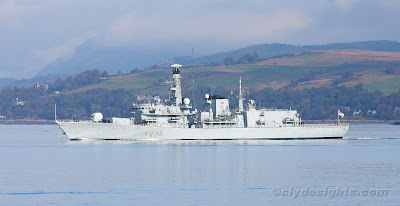 Continuing her working up before resuming active service, the Type 23 frigate MONTROSE was seen on Saturday after leaving the Gareloch, as she made her way out to sea. Like some other members of the 'Duke' class, the rescue boats fitted on either side of the funnel have now been replaced with a fast rescue craft mounted in a wave-compensating davit. This posting, made last made, shows a comparison between the two.